Performers include: Cuba Gooding, John Travolta, David Schwimmer, Sarah Paulson, Courtney B. Vance, Nathan Lane, Kelly Dowdle, Jake Koeppl, Evan Handler, Dale Godboldo, Rob Morrow, Kenneth Choi, and Bruce Greenwood. This true crime drama is an anthology series. Each season is a self-contained series within a series, telling the story of a separate crime. Based on the book The Run of His Life: The People v. O.J. Simpson by Jeffrey Toobin, the first season tells the story of the OJ Simpson murder trial from the perspective of his legal team. A retired American football player, football commentator, and actor, Orenthal “OJ” Simpson (Cuba Gooding), of the Buffalo Bills and the San Francisco 49ers, met Nicole Brown (Kelly Dowdle), while still married to his first wife, Marguerite L. Whitley. Simpson and Brown wed in 1985. During their marriage Simpson plead “no contest” to charges of spousal abuse. Nicole filed for divorce in 1992. On June 12, 1994, Brown and her friend, Ronald Goldman (Jake Koeppl), were killed outside her Brentwood condo. Simpson was charged with their murders. In the criminal trial, Simpson’s so-called “Dream Team” of defense lawyers includes: F. Lee Bailey (Nathan Lane); Robert Shapiro (John Travolta); Robert Kardashian (David Schwimmer); Alan Dershowitz (Evan Handler); Johnnie Cochran (Courtney B. Vance); Carl E. Douglas (Dale Godboldo); and Barry Scheck (Rob Morrow). 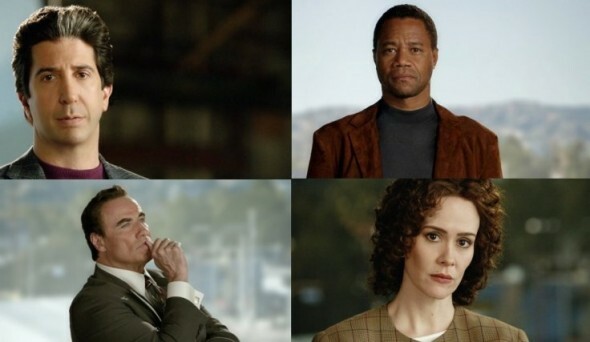 The prosecutorial team includes Deputy District Attorney, Marcia Clark (Sarah Paulson); and Los Angeles County District Attorney Gil Garcetti (Bruce Greenwood). Judge Lance Ito (Kenneth Choi) is the presiding judge. What do you think? Do you like the American Crime Story TV show? Do you think it should be cancelled or renewed for another season?